With CC #1, cast on 100 stitches (either cast on all sts on the 16″ circular needle, or cast on to dp needle and divide stitches evenly). Work entire hat in rounds in knit 1, purl 1 ribbing. Work 2 rounds in CC1, 4 rounds in MC, and 3 rounds in CC3. Switch to MC, and continue working ribbing in rounds until hat measures 10″ from cast on row. Work top shaping: Round 1: *work 8 sts in ribbing, k2 tog; rep from *. (You’ll need to switch to the dp needles eventually, if you are using a circular needle). Round 2: *work 7 sts in ribbing, k2 tog; rep from *. Round 3: *work 6 sts in ribbing, k2 tog; rep from *. Round 4: *work 5 sts in ribbing, k2 tog; rep from *. Round 5: *work 4 sts in ribbing, k2 tog; rep from *. Round 6: *work 3 sts in ribbing, k2 tog; rep from *. Round 7: *work 2 sts in ribbing, k2 tog; rep from *. Round 8: *k1, k2 tog; rep from *. Round 9: *k2 tog; rep from *. 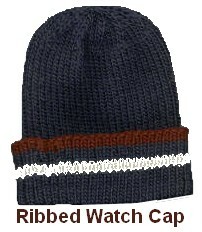 “Ribbed Watch Cap” pattern © 2001-2016 By Laurie Kynaston of VintageKnits.com. You may share this pattern providing this notice remains attached. This pattern is intended for personal use, or for charitable donations/sale. Please contact me at lavs@vintageknits.com for permission to include this pattern in any written collection or for commercial purposes. You are most welcome, Marilyn. Thank you for your kind comment.